Cardiff Fire's Jackson Price is in Siberia. Pic: James Assinder. Jackson Price is preparing for ice hockey action in Siberia as his club, Cardiff Fire, entertain Peterborough Phantoms at the Viola Arena on Saturday. Cardiff Met student Jackson Price is in the Great Britain team for the 29th World University Winter Games in Krasnoyarsk, Russia, while Fire take on Phantoms in Cardiff Bay (6.30pm). Centreman Price, a key Fire player, is among 58 GB athletes and support staff in Russia. 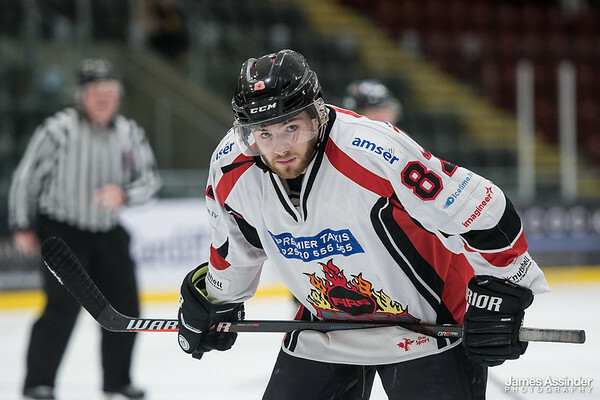 Swindon-born Price, a 22-year-old who played in all five games at the 2017 World University Games in Kazakhstan, is a tenacious centre who has played for Cardiff Fire over the last three seasons. GB play Latvia, Switzerland, Spain, Canada and Kazakhstan in their group, while the other section features Hungary, Japan, Czech Republic, USA, Slovakia and the Russian Federation. The University Games opening ceremony is on Saturday, March 2 and runs for 11 days across 10 venues. Cardiff Fire have one NIHL South Two fixture this weekend, playing on Saturday when Cardiff Devils are away against Coventry Blaze. Head coach Mark Smith’s team includes Swedish defenceman Viktor Langseth, a tough, hard-hitting defenceman and Hungarian-born forward Tamas Elias. Fire lost 8-1 against title-chasing Solent Devils last weekend, although the score was 1-1 with 12 minutes played and the visitors only led 2-1 going into the second period. Cardiff outshot Solent 47-34, but were denied by Solent’s goaltender and man of the match Christian Cole. Elias scored for Fire, finishing neatly from a flowing move, and at that stage Devils looked on edge. Now Fire are focused on chasing down Phantoms, who are four points ahead of the Welsh club, but have played four more fixtures. Scorers, Fire: Tamas Elias 1+0, Jordan Powell 0+1, Elis Sheppard 0+1. Devils: Mitchell Murray 1+1, Mark Pitts 2+1, Andrew Campbell 1+1, Richard Facey 1+1, Alexander Trendall 1+0, Daniel Shier 1+0, Alex Cole 1+3, Daniel Lackey 0+2, Russell Hounsome 0+2, Rhys McCormick 0+1, Ben Lock 0+1, Alex Murray 0+1. Period scores (Fire first): 1-2; 0-4 (1-6); 0-2 (1-8). Shots on goal: Fire (on Christian Cole) 24+7+16=47; Devils (on James Whiting/Ben Scanlon) 7+27+10=34. Penalties in minutes: Fire 6+8+8=22; Devils 8+0+0=8.